I'm doing #2 of the class illustration set that he posted. The order is as follows -#1 MALE HALF-ELF SORCERER, in an active pose, facing the viewer. This CLASS ILLUSTRATION should use a format similar to those in the 4e PH. Features: tanned skin, dark green-black hair. Armor: Cloth armor, no shield. Weapon: Holds an ornate brass orb. Action: Active pose, facing viewer. 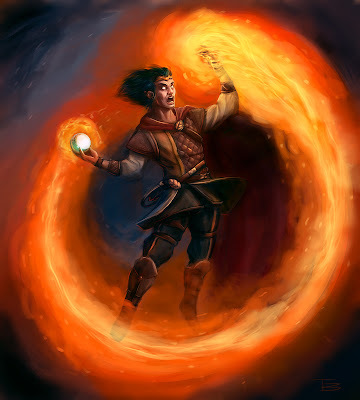 The sorcerer should look like he’s in the center of a storm of swirling fire, elemental power that originates from him but is almost beyond his control. But very powerful and self-assured. I kind of dig the way this one turned out. I got pretty discouraged halfway through but it came together reasonably OK.